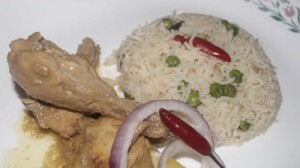 If we get invitation in Bangladesh, we know or feel to have polau (pilaf), korma (meat that is cooked in slightly-sweet, creamy gravy) and kalia (meat that is cooked in hot, spicy gravy). It is hard to find any occasion where polau, korma and kalia are not cooked. I have tried to simplify chicken korma for abroad kitchen. I use almond meal instead of poppy seeds. If you want, you can use white poppy seeds’ paste. Enjoy the flavour of chicken korma. 1. Wash chicken pieces well and drain thoroughly. Add yogurt, garlic, ginger, coriander and mix well. Marinate for at least hour up to overnight. 2. Saute onion on medium heat in oil until golden brown and add cinnamon, cardamom, clove and bay leaf, stirring until fragrant. 3. Add marinated chicken and salt. Cook it on medium high. Stir occasionally until oil comes out. 4. Add 2 and 1/2 cups of water and cook it under closed lid. Stir occasionally and cook it till chicken becomes tender. 5. Add almond meal, sugar, raisins, clarified butter, kewra essence and green chillies. Check to see if sugar has balanced out the tartness of the yogurt. Cover and cook another 5 minutes on medium-low and remove from the heat. 6. 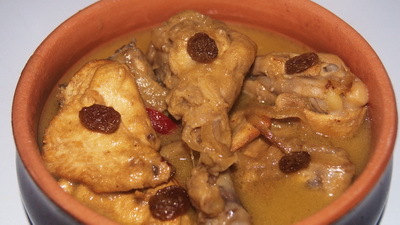 Serve Chicken korma with Polau. Tips: you can use fried onion in chicken korma to enhance the flavour. Very easy to understand. Thank you. Now I can tell my wife there is no excuse for not cooking Korma. Now you can even tell yourself that there’s no excuse for trying to cook things yourself. (Unless of course you got married just so that the wifey can cook for you full-time). Hihi! So no excuse..lets start cooking. Even I think that Hubby should cook too. Can you please tell me where I can buy that almond meal or poppy seed paste? Can I find it in woolworth? Hi! Almond meal is available in Woolworths, Coles or any organic super market. For white poppy seeds you need to Indian grocery. Thanks. Dear Apu, I can not thank you enough for your yummy recipes. I have been trying to cook this chicken korma for long time and there was always something missing. After trying your recipe I have finally found that missing piece. Thank you again.EID MUBARAK to you and your family. Dear Rownak, I am enjoying your recipies very much. thanks! can you pls. tell me what is sultana? Good to know that you are enjoying and appreciating my recipes. 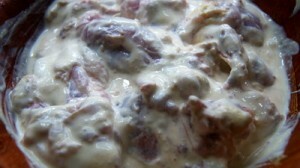 Sultana / raisin is kismis in Bengali. Thanks.